Not so much a dive site but a phenomenon where you can swim with rays and nurse sharks in 8ft of water. Its south of Hol-Chan Marine reserve in zone D.
Jean Michel told us that they are female juveniles and they come to nurse here feeding of the scraps of the local fisherman. "For several years, local fishermen often cleaned their catch in this area, located just inside the reef, to the south of Ambergris Caye. When fishermen noticed that their activity had attracted Nurse Sharks and several Southern Sting Rays, they reported this information to the dive operations in San Pedro, who then dispatched some divers to investigate. What they found was a bonanza, and "Shark-Ray Alley" quickly became a very popular dive site. This is a must stop for the first introductory dive in Belizean waters. Zone D is only 15 minutes south of San Pedro by boat. 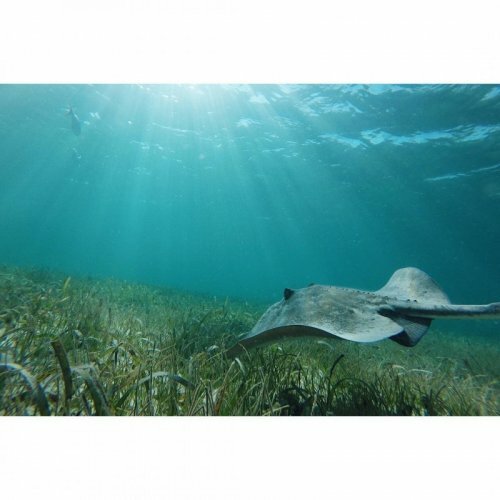 Shark Ray Alley has a maximum depth of 30 feet and excellent visibility. You can almost always see all species of fish including jacks, groupers, snappers, parrot fish, angel fish, barracuda, eels, spider crabs, lobster, and nurse sharks. Divers are occasionally cautioned regarding the currents. As soon as your boat arrives in the area, you will notice a number of dark shadows in the shallow (eight foot deep) waters. These are the sharks and rays that hear the boat approach and come in search of a few scraps of fish. Quality of reef or wreck. Fish life on the day. How much fun was this dive. Ease of getting to the site. Probably frustrating for experienced divers who like the proper marine ecosystem, this is clearly somewhat skewed because of the fish cleaning the fishermen created. However I feel that these have a good effect on snorkelers who can get interested in the ocean.